While other parts of the country are buried under snow and ice, we are experiencing a down right mild winter here in deep south Texas. December and January, so far, have seen daily averages nearly 5 degrees above normal. The mild temperatures have even brought the tarantulas out early. I found this young female at work, in our upper air building, where we inflate weather balloons. I have to admit, I didn't see her clinging to the bottom of the overhead door until it was all the way open. Fully open, the base of the door is approximately 13 feet overhead. Had she fallen from even a fraction of that height, her delicate abdomen would have exploded like a dropped light bulb. So, I eased the door back down and was able to pluck her from her predicament before she fell to a certain death. 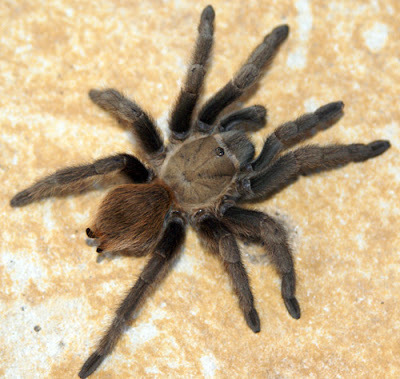 In my experience, female Texas Tan tarantulas have always been relatively calm and have never offered to bite while being handled. Males, on the other hand, nearly always display aggressive behavior and have even jumped on my shoes as I've tried to move them on their way. This little lady was a pleasure to work with as I positioned her for these photos. I hope our mild winter continues and long range computer models show it will. Living in deep south Texas definitely has it's advantages and seeing wildlife throughout the year is only one of them. I loved this post, Baby!!! The photos are really nice too and she is a beautiful little lady! I know that you are the weather expert but I have been freezing lately! I know. I freeze below 70 degrees. I really enjoyed this and am now anxiously looking forward to your next post! Thanks for the comments, BABY! She was fortunate that I found her because there are OTHERS here that would have taken a broom to her! I think the most guilty party just retired though. I've tried to teach everyone at work that tarantulas are harmless but, wouldn't you know it, I still find countless numbers dead during mating season. I even put up a sign one year "Please don't kill tarantulas". I found dead tarantulas nearly every morning that spring. When I ask who or why, it's always the other guy did it! I think the recent retiree hated them the most, though. Thanks for caring about the spiders! Oh yea, you own one! Nice post about another furry friend. Ask me some day to tell the story about a young gal who was catching these guys to pay her maternity bill. As to the weather?? we are having some. Leo would like some nice sunny days to make the cold and high fevers go away. I just want to know who decided to change the weather home page. I don't like it. I liked my graphical map with your drawings on it. Yes, as soon as I brag on our warm winter, it get's cold! The graphical forecast is still there. Just click on the "RGV Graphicasts" icon now at the top of the page. We wanted it to stand out more. Give our love to Leo. I don't see tarantulas around here, but I have found many black widows. Do you save them from certain death too or do you not find them in S. Texas? I may not be a spider lover, but I can appreciate a nice photo of one and these are very nice. Although black widows are down here, I can't remember the last time I saw one. They're seen more often in South Central Texas. I typically see several when we visit Darlene's mom. And yes, I typically rescue them from certain death when possible. Thanks for the nice comments about the photos! I hope Steve is continuing to heal after his fall. Nice post Jim. Now, all you need to do is put one next to the mouse on the new WCM's desk like you did to me! The new WCM's time is coming! Thanks Pete! I guess it's a matter of growing up with them. My dad taught me how to catch Texas Browns in my grandfather's yard when I was barely walking. I did get creeped out when I bought a couple of Brazilan bird eaters years back. Talk about nasty! You're making me very envious up here at elevation 3900 feet and latitude 32 degrees north! 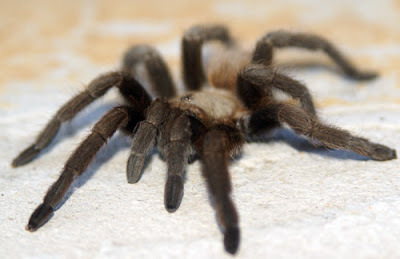 In this part of Texas, we won't see our tarantulas until spring! And most of those will be males, full of fight and short (relative to females) on life expectancy. You still have to make your southern AZ trip. Gila Monsters, Tiger Rattlers, Bark Scorpions, Elegant Trogons and the occasional jaguar. You know you want to! I'm just wondering if it feels like January to you yet! ;-) Please, please, please make the weather all better now!